Thanks Maggie. 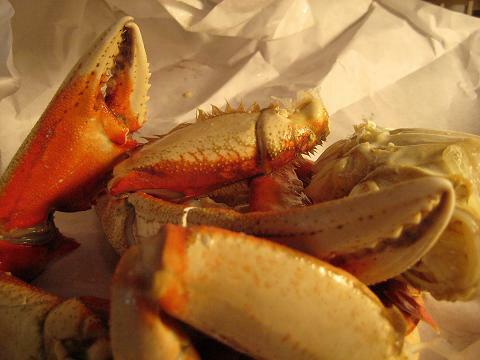 After being admonished by Mike for having a dry crab on the previous show, I vowed not to let him down again by putting a tired crab in front of the camera. 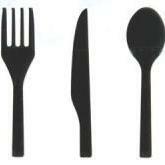 (I take on the burden of not only being the cook, but also the role of food stylist). 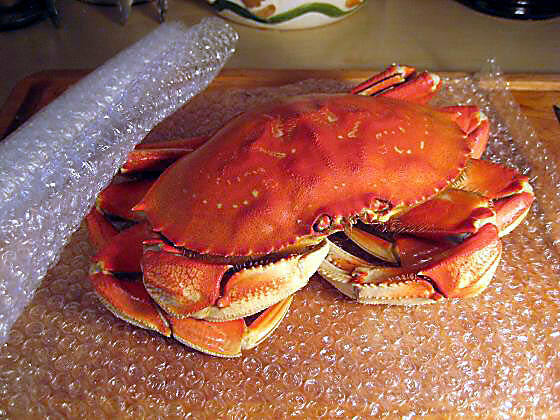 In addition to being schooled on dry crabs on the set, Mike also told me to make sure the crab shell didn't break in transit from my home to the studio. Thank you for this behind the scenes look at live cooking segments. It sounds like they were lucky to have such a passionate home cook on the show. I hope someone else snaps you up soon. And your fish guy sounds like a character. Thanks, and yes, Mike the fish guy is a character-and one heck of a nice man. He's part of a member of a vanishing trade, old-fashioned Fishmongers who actually know how to scale and filet fresh, whole fish. 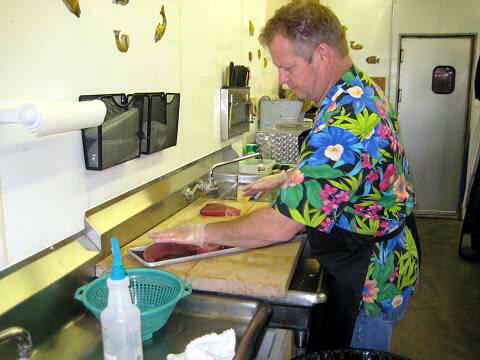 He's fished commercially in Alaska and is an expert on the seafood and shellfish that comes from the waters of the Pacific Northwest. And the story of course wouldn't be complete without some photos of Mike and his shop. A great read, thanks David! YouTube link to the broadcast please. Very nice job, David. Thanks for sharing you perspective - many communities don't have a grassroots guy of your caliber. Keep doing what your doing. Thanks Peter, I appreciate the kind comments. 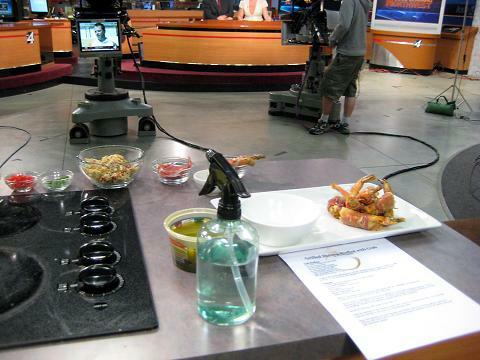 The true story about cooking on local television is deeper than my appearances on KXLY or Mike the fish guy's Dungeness Crabs. The real story is about the often-overlooked world of cooking on local television. Yet it's also a story about the birthplace of food on TV-local television. I'm but one of any number of cooks across America who work in near-anonymity, presenting food and cooking on local television. I'd like to think that in some small way we are doing our part to celebrate and promote the foods, farmers and purveyor's in our communties that provide us with the products we use in our shows. That is a part of the grass-roots effort that you are speaking to. I often say that we must respect the traditions of the past in order to value what we have today-and that applies to food on television. The first cooks who appeared on television built the foundation for today's mass-marketed world of food on tv. It may appear that "Meals in 30 Minutes" or "Semi-Homemade" don't have any link to the past whatsoever. They do. If it weren't for Mrs. Florence P. Hanford cooking on Channel 3 in Philadelphia in 1949, there just might not be an entire network devoted to food and cooking today. (Nor would we likely see brand-names like Rachel Ray or Sandra Lee). 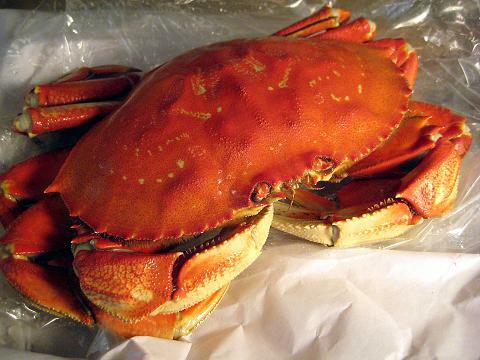 My hope is that the story of my travails with a diva Dungeness Crab on KXLY will provoke some thought and discussion about how the cooks on local television today carry-on the traditions of the past. Thank you again. Is there any site online where we can view your past segments? 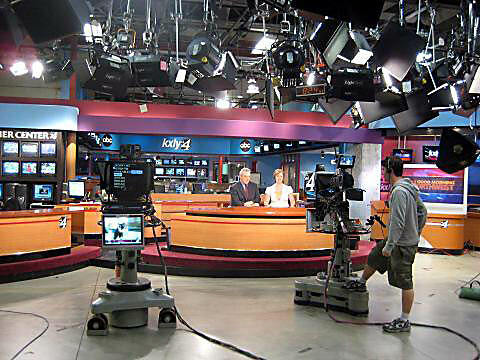 As of today, no, we don't have a link at KXLY that would allow you to see videos of past shows-another one of the interesting little details that are unique to cooks on local television. We aren't dealing with the most technologically advanced editing equipment at my level of television. As you can see in the above photo, the normal course of action was to give the director a blank VHS tape to record each show. 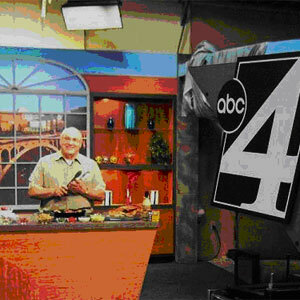 At the time I started cooking on KXLY, we didn't have the capacity to record the shows directly onto CD's. 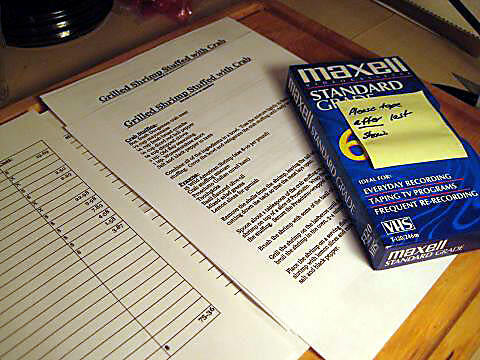 (The photo also depicts the "script" I use on-set, including a copy of the recipe. You can also see my invoice for the groceries, with the huge budget of just over $75 for the Shrimp Stuffed with Crab). Then we convert the VHS to a CD and add graphics and subtitles. It's a very lenghty and somewhat expensive process. It seems unimaginable now, but I started cooking on television years before anyone had even heard of YouTube, I-Phones or any of the other means for instant posting of video on the internet that now pervade our daily lives. I will see what I might be able to do. Thanks again. Well, shoot! I live in KXLY's broadcast area, and thought "Huh! I'll have to try and catch this show!" Then I got to the last section. What a bummer. You also threw me for a loop with the name Teresa Lukens. We bought our first house from a Teresa Lukens (same spelling) in nearby Sandpoint, Idaho. I went looking for a bio of your Teresa online and it doesn't seem to be the same person, though. Nice to hear from a fellow resident of the Northwest. Thank you. Teresa has been at KXLY for many years. Although Sunday Morning Northwest was cancelled, she and Rick still do their morning show on KXLY-AM 950 radio, and she still appears on the various news programs. As I mentioned above in the story, Teresa was the perfect host to work with. 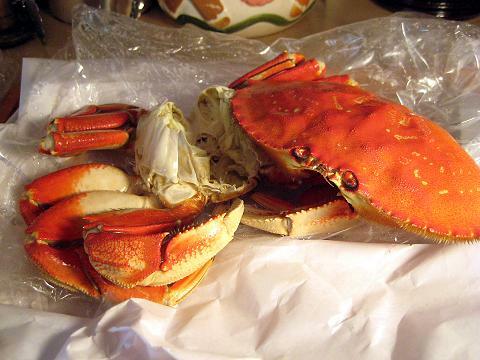 (And I've worked with other hosts-er, news personalities-who didn't have a clue as to the difference between a Dungeness Crab or a Blue Crab). Teresa's timing was impeccable. 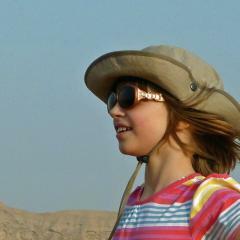 She would always let me take the lead, then would ask questions at precisely the right time. 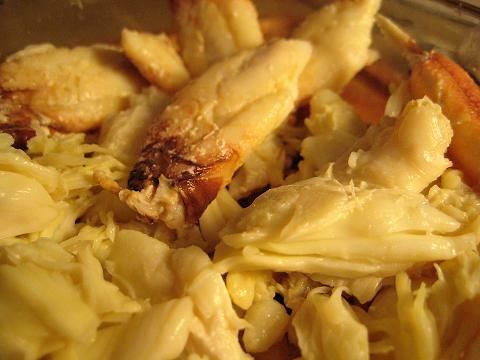 If we were using fresh bread crumbs to make crab cakes, she'd ask why they were better than canned bread crumbs. 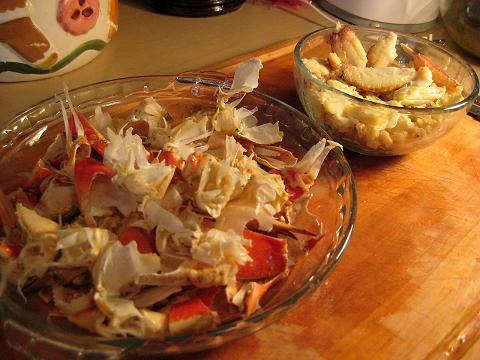 If we sauteed the crab cakes in clarified butter, she knew to ask how to make clarified butter-and why it was better for frying crab cakes than regular butter. Over the course of the years that we worked together, we developed a level of comfort with one another that I think came across to our viewers. Thanks again. David, perhaps you took my post not as I intended. I would love to see a youtube of your broadcast. David, how did you get started with the show? 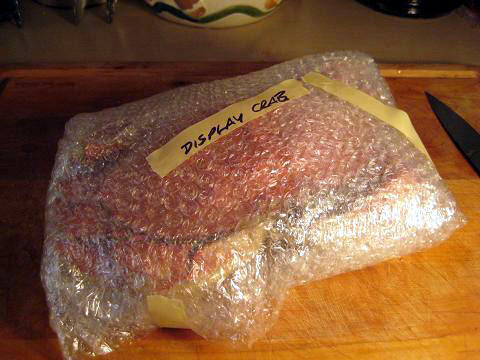 Is your background in professional cooking? Did you know someone from the show? It also sounds as if you weren't the only guest chef on the program; is that right? Who were the others -- home cooks like you or local restaurant chefs? As for my background, no, I am not a "professional" chef. I'm what I would describe as a very studied self-taught home cook. And while I've cooked and worked in restaurant kitchens, I've never done so professionally. I'm an average guy with a day job that happened to find a love in food and cooking, and that led me to cooking on television-which has led to me writing about food, cooking and dining. Unlike most people who find a career in television, I didn't start in a small market and then go Hollywood. I actually started my stint in tv by entering a competition that was filmed in Hollywood and ran nationally on PBS-"MasterChef USA." Years before there was "Top Chef" on Bravo, "Iron Chef America" on Food Network, and the abysmal "Hell's Kitchen" on Fox, "MasterChef" on the BBC was the pre-eminent cooking competition on television-with competitions for both professionals and amateurs. The BBC brought "MasterChef" to PBS in 1999 and thus began the competition to name America's top "amateur chef." I happened to catch an episode of Season One of "MasterChef USA," and at the end of the program, I decided to write to the producer's for information about the competition. 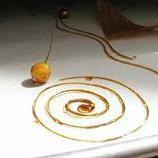 The competition format for “MasterChef USA” began with written entries. 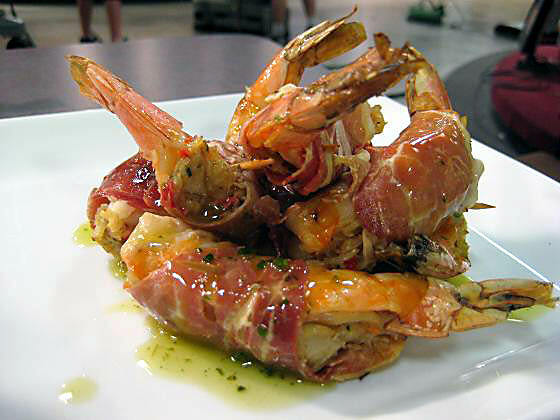 About 20 of the written recipes were selected and the "chefs" were invited to regional cook-offs where three would be selected to be a part of the show. The final group of 26 amateur cooks from around the country came together in Los Angeles for filming a 13-week competition. After 12 weeks of eliminations, I “survived” as one of the top three contestants that would go on to vie for the title of “MasterChef USA,” in the 13th and final episode. After starting my television cooking career on PBS at such a lofty level, I guess there was one direction to go-back down the media ladder to cooking on local television. But I wouldn’t call it a fall from grace. 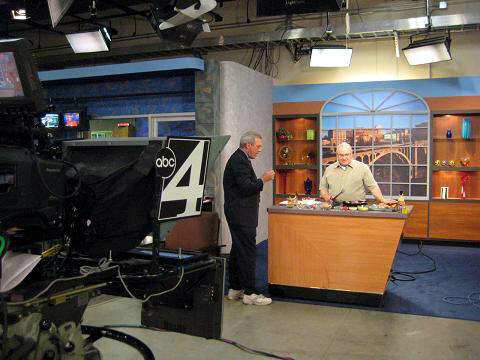 Rather, after my fast start on PBS, I returned to my roots and found a home cooking on local television in Spokane. I didn't know "who can talk to who"-I didn't know a producer, director or cameraman. I just sent them a letter telling them my story and they responded by inviting me to come cook on "Sunday Morning Northwest." 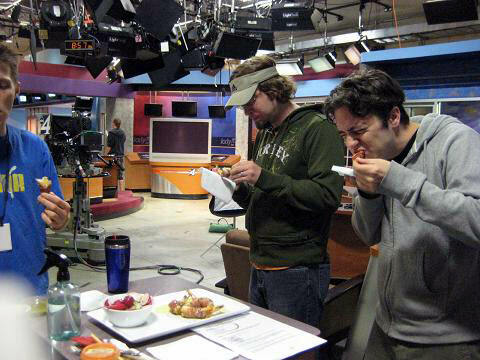 Once I settled in at KXLY, I discovered a respect and admiration for sharing the craft of cooking through the intriguing medium of television. I don’t think I would have found that same appreciation had I gone directly from “MasterChef USA” to become the star of a cooking program on the biggest food network on cable television. One could say that in my case, being humbled by starting big and then finding my way back home became a gift. We tried to vary the people who came on the show to present a dish. One week I might be showing the viewers how to mash potatoes, then the next week it might be the junior winner of the Hershey's baking chocolate competition at the fair. The next week might showcase a local Chef cooking a specialty from their restaurant, or a group from a local Church promoting a Holiday cookie drive. That variety of cooks, chefs, kids and just plain people who liked a good molasses crinkle cookie is part of what makes live, local television so fun and memorable. Enjoyed your piece and I can relate. Can I ever! I am a chef and I played one on television. I started by doing a half-hour cable access show in Memphis, Tennessee. (I was invited to do it). I did that for about a year. One day I received a call from the director of programming at the local CBS affiliate - Channel 3. He asked me if I'd like to do a regular segment on their local morning show. He said there would be no pay initially, but they would pay for ingredients and I could plug projects, books etc. The show was canceled after about six months. (The host went on to do a children's show on the local PBS station). But, I wasn't canceled. They asked me to do short segments for the noon news. Sent a location truck to shoot them at my school (The Memphis Culinary Academy). That worked well for a year or so. Then I noticed my segments were being sponsored. I asked about that and if any revenue was coming in. They said yes, and they would figure out how much of it I was entitled to. Six more months. No revenue. About this time in conjunction with a friend of mine who did video and had an advertising agency, we made a demo tape and sent it to the Food network at their request. Also about that time the Food Network got rid of their programming director and the focus switched from wanting a professional to wanting "home" style stuff. So, that went nowhere. My friend suggested I change channels - to the local ABC affiliate - Channel 13. The program director offered me a spot on the noon news with the munificent stipend of $25.00 per show. Hey, it was $25,00 more than I was getting. I took it. Then he asked me if I would do a restaurant review thing for the evening news, too. I said sure. I didn't really review them. I went in,talked to the chef, cooked with him/her and then sat down and ate. Then they canceled the noon news. I sensed the station might be in a wee bit of trouble. They were. So, he asked me if I would do a segment on their morning show. Cook a little and be part of the panel and sit around and rap. I did and enjoyed it. Then they canceled the morning show. Then they sold the station. Then they canceled the evening news. I've never been personally canceled. But, I am beginning to wonder about the coincidence of every show I've ever been a part of being canceled. Chef Carey-great hearing your story, although I'm sorry you suffered the same cancellation fate that I did. Don't feel alone-my appearances on KXLY were cancelled, as was the MasterChef USA series on PBS, as was my stint doing a daily cooking tip on KQNT AM 950 in Spokane. I too suffer from the perpetual cancellation bug. I don't know if my 15 minutes of fame have already passed or not-at least I'm not openly admitting to it, and I'm still sending out CD's and proposals to try and catch another wave. Keep sending inquiries to the producer's and you'll definately get back on. Did you appear on "AM Northwest" on KATU-ABC? I think that's the only show of its kind with a local format left in Portland. 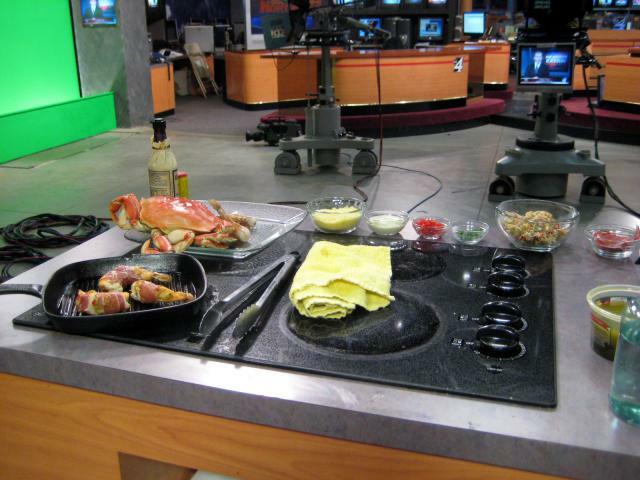 I did a cooking segment on "AM Northwest" in Portland about the time I started working with KXLY in Spokane. We did appetizers and cocktails for New Year's Eve. I was paired with the weatherman at the time-a young guy who I nearly choked with my cranberry martini. A few years later I was watching CNN one morning and the same guy shows up as the head weather anchor-Rob Marciano. I guess some people who start on local TV do eventually hit the big time. 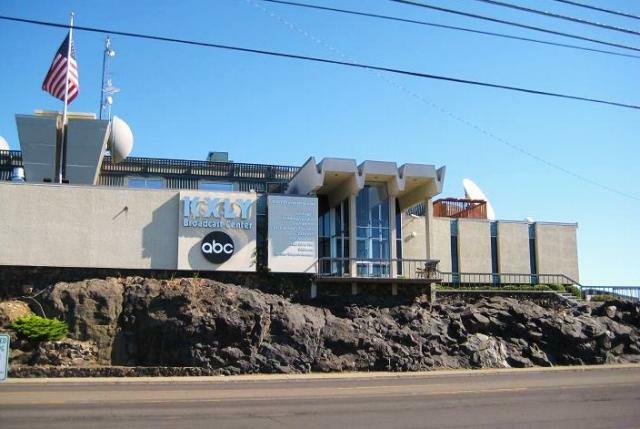 Did you appear on "AM Northwest" on KATU-ABC? I think that's the only show of its kind with a local format left in Portland. Every television show seems to run its course. Whether it’s cooking on local television in Spokane, or “Seinfeld” on NBC, eventually every show gets cancelled, the contracts aren’t renewed, or the on-air personalities go on to other projects. Whatever words go in the press release to describe the “change in direction,” it’s a sad day indeed when any show comes to an end. But those of us who’ve had the great pleasure and opportunity to cook on local television realize our good fortunes. I was able to bring a part of my life to our KXLY viewers-and I was able to promote the local farmers and fishermen that bring their products to our tables. I was able to share my love of the elusive, wild huckleberry with my neighbors. We shared a laugh or two and a great love of food and cooking. When people step on a stage and accept an award for appearing on television or in a movie, we often groan at the obligatory speech thanking “the best crew I’ve ever worked with.” As I reflect on my run of shows on KXLY, I realize that the recognition of the crew is just as important as my own self-satisfaction or the thank you letters from our viewers. 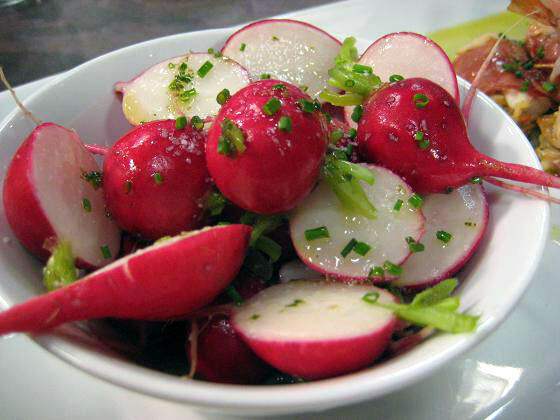 The crew-the news journalists, the team of producers, directors, engineers, sound, camera and lighting technicians-are the ones who made my crab-stuffed shrimp and radish salad come to life. Some of the crew members of “Sunday Morning Northwest” were recent graduates of the Edward R. Murrow School of Journalism down the road at Washington State University in Pullman. And like me, some of them were simply trying to catch a break in television at a local station in a mid-market. During a commercial break, I’m tending to the stuffed shrimp in my “kitchen.” Note the backdrop scene of Spokane behind me. (No, it’s not a live shot of the Monroe street bridge, although it appears to be when you’re watching from home). Sometimes stories like mine tend to fade away over time. The internet, like television, is sometimes a very fickle form of media-what's popular at one moment often vanishes within an hour and the original story is lost forever. But rather than fade away, I'm hoping that in the coming weeks I'll be sharing some good news with you and we'll continue our journey into my story of cooking on local tv. I'm currently in discussions with another station in Spokane to see if they are interested in working with me to air some cooking segments. Our discussions are only in the initial stages, but I sense some interest on the part of the Producer and there is a second request for more CD's of my work. I hope that in the next couple of weeks I'll have some good news to share. Unfortunately, the word came in the form of an email yesterday-"Mr. Ross, we have decided that we are not interested in pursuing cooking segements for our Saturday morning news program. However, we will keep your CD's on file in case we have an interest in the future." And so the search for a new home for cooking on local television continues. It's funny how sometimes things come full circle. Well, I'm hoping the circle is almost complete, it's just going to take a bit more time and perseverance on my part for that to happen. So I'm given the pink slip when KXLY cancels "Sunday Morning Northwest." After some initial interest on the part of KHQ, I'm sent the "Dear John" e-mail letting me know that they aren't interested in hosting cooking segments on the morning program. I cower back to KXLY, swallowing my pride and using the little amount of local star power I have, to basically beg them to take me back. I'll tape any time of day, any day of the week, just let me cook. I'm hoping my great relationship with Teresa, one of the top on-air personalities at KXLY, will help in the effort. I've set the computer to send a message to KXLY every two weeks. 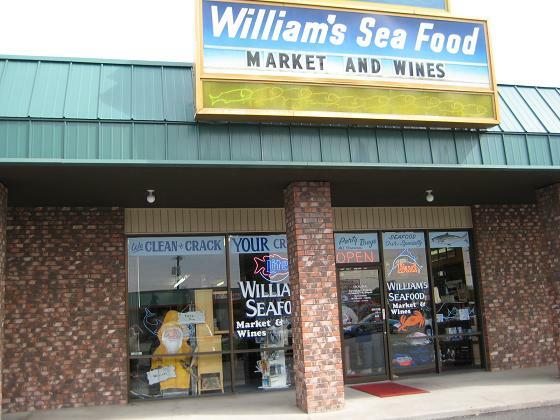 I'm hoping it's just a matter of time before I'll be back on KXLY, serving-up some of Mike's seafood to the viewers.